Process payments with Wordpress, Gravity Forms and the eTapestry Payment Plugin. Creates a payment and registers a gift through your existing eTapestry/Blackbaud account. 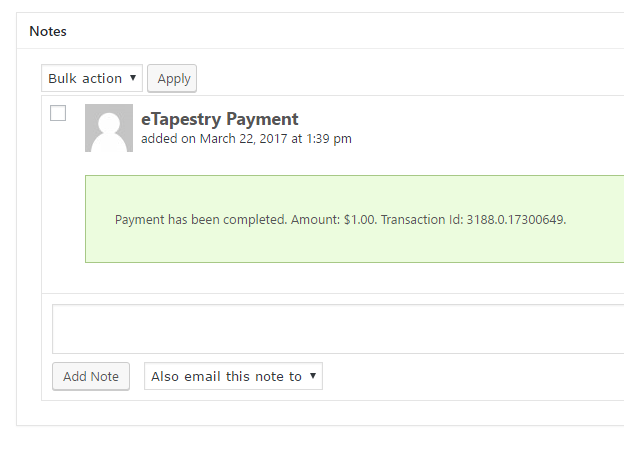 Process website payments through your eTapestry/Blackbaud payment enabled account from your WordPress Gravity Forms! Install your eTapestry Payment Plugin and enter your eTapestry login and password credentials in Forms>Settings>eTapestry Payment. 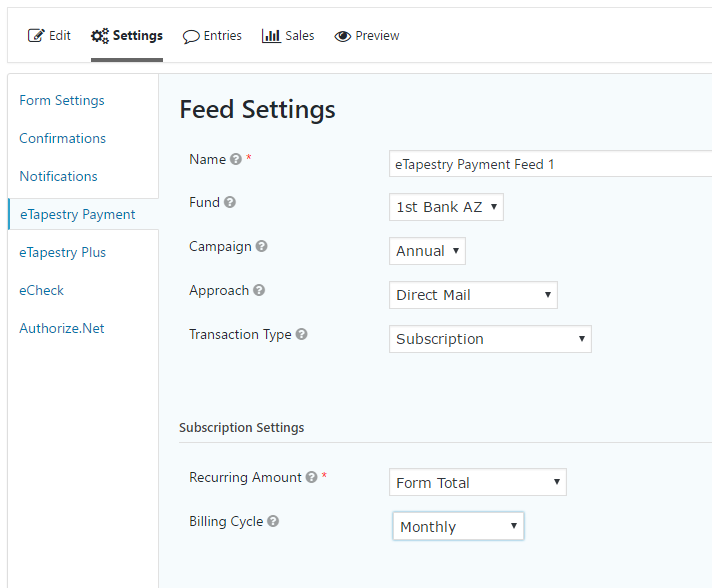 Then create a new eTapestry Payment feed in the form you’d like to integrate. Select your Fund (required although you can specify it is mapped to a required user choice), Campaign and or Approach, and map other form fields to the plugin like address and email. Set if you want to allow for an email only match when searching for existing accounts. For subscriptions you can choose manual or automatic processing (if auto is set up on your eTapestry account). The plugin uses the Cardholder name field for the eTapestry Account Name unless you specify a Gravity Form Name field. This plugin integrates with your eTapestry account to pull your information into the settings fields so you can select parameters (like your Fund) just like you were on eTapestry. Please make sure you have asked for API access from eTapestry as it isn’t automatic! Version 4.4 added the ability for the User to select the fund. Version 4.6.5 adds the IP Address method to allow for blacklisting IP Addresses through Blackbaud. (You can disable through a filter documented in the readme.txt file in your plugin. Version 4.7 added the ability to choose your login method (API (new) or Legacy). If you do not wish to use your etapestry payment processor, please consider the eTapestry Mapping Plugin that allows for gift or contact creation and user defined field mapping. It works with other payment processors or no payment at all. Need all of the above for the most flexibility in integrating all of your Gravity Forms with eTapestry? Get a $50 discount by purchasing both the Mapping and Payment plugins at full price. Use coupon code ‘bundle’ at checkout. This plugin will continue to function after your download window has expired as long as the site url and serial key are not changed. If you are experiencing issues, please check out my Frequently Asked Questions as other may have had the same issue. All support issues are answered quickly. You may also want to check out my youtube channel for videos on setting up eTapestry forms on your WordPress site.